Nancy Ward gravesite in Polk County. Last Beloved Woman of the Cherokees, Nancy Ward was born in 1738 at Chota and given the name Nanye-hi, which signified “One who goes about,” a name taken from Nunne-hi, the legendary name of the Spirit People of Cherokee mythology. Her birth came near the outbreak of a smallpox epidemic that resulted in the deaths of approximately one-half of the Cherokees. The identity of her father is not known, but the Cherokees practiced a matrilineal tradition, and Nanye-hi’s mother was Tame Doe, of the Wolf Clan, a sister of Attakullakulla, civil chief of the Cherokee nation. In her adult years, observers described Nanye-hi as queenly and commanding in appearance and manner and as a winsome and resourceful woman. By age seventeen she had two children, Five Killer and Catherine. 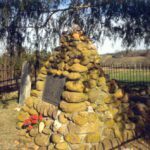 Her husband was killed in a raid on the Creeks during the 1755 battle of Taliwa, where she fought by her husband’s side, chewing the lead bullets for his rifle to make them more deadly. When he fell in battle, she sprang up from behind a log and rallied the Cherokee warriors to fight harder. Taking up a rifle, she led a charge that unnerved the Creeks and brought victory to the Cherokees. Because of her valor, the clans chose her as Ghighau “Beloved Woman” of the Cherokees. In this powerful position, her words carried much weight in the tribal government because the Cherokees believed that the Great Spirit frequently spoke through the Beloved Woman. As Beloved Woman, Nanye-hi headed the Women’s Council and sat on the Council of Chiefs. She had complete power over prisoners. Sometimes known as Agi-ga-u-e, or “War Woman,” she also prepared the warriors’ Black Drink, a sacred ritual preparatory to war. Bryant Ward, an English trader who had fought in the French and Indian War, took up residence with the Cherokees and married Nancy in the late 1750s. Ward had a wife, but since Cherokees did not consider marriage a lifelong institution, the arrangement apparently presented few problems. Ward and her English husband lived in Chota for a time and became the parents of a daughter, Betsy. Eventually Bryant Ward moved back to South Carolina, where he lived the remainder of his life with his white wife and family. Nancy Ward and Betsy visited his home on many occasions, where they were welcomed and treated with respect. Nancy Ward also became respected and well known by the settlers moving across the mountains into the Cherokee territory. James Robertson visited her home. 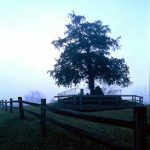 John Sevier owed much of his military success to her: on at least two occasions, she sent Isaac Thomas to warn Sevier of impending Indian attacks. She once stopped the warriors of Toqua from burning Lydia Bean at the stake. Ward kept Bean, the wife of Tennessee’s first permanent settler, at her home for a time before allowing her to return to Watauga. Ward made good use of the white woman’s enforced stay and learned the art of making butter and cheese. Subsequently, Ward bought cattle and introduced dairying to the Cherokees. Ward exerted considerable influence over the affairs of both the Cherokees and the white settlers and participated actively in treaty negotiations. In July 1781 she spoke powerfully at the negotiations held on the Long Island of the Holston River following settler attacks on Cherokee towns. Oconastota designated Kaiyah-tahee (Old Tassel) to represent the Council of Chiefs in the meeting with John Sevier and the other treaty commissioners. After Old Tassel finished his persuasive talk, Ward called for a lasting peace on behalf of both white and Indian women. This unparalleled act of permitting a woman to speak in the negotiating council took the commissioners aback. In their response, Colonel William Christian acknowledged the emotional effect her plea had on the men and praised her humanity, promising to respect the peace if the Cherokees likewise remained peaceful. Ward’s speech may have influenced the negotiators in a more fundamental way because the resulting treaty was one of the few where settlers made no demand for Cherokee land. Before the meeting, the commissioners had intended to seek all land north of the Little Tennessee River. Nevertheless, the earlier destruction of Cherokee towns and the tribe’s winter food supply left many Indians facing hunger. As a result of the desperate circumstances, Ward and the very old Oconastota spent the winter in the home of Joseph Martin, Indian Agent to the Cherokees and husband of Ward’s daughter Betsy. Again at the Treaty of Hopewell in 1785, Ward made a dramatic plea for continued peace. At the close of the ceremonies, she invited the commissioners to smoke her pipe of peace and friendship. Wistfully hoping to bear more children to people the Cherokee nation, Ward looked to the protection of Congress to prevent future disturbances and expressed the hope that the “chain of friendship will never more be broken.” (1) Although the commissioners promised that all settlers would leave Cherokee lands within six months and even gave the Indians the right to punish recalcitrant homesteaders, whites ignored the treaty, forcing the Cherokees to make additional land cessions. The Hiwassee Purchase of 1819 forced Ward to abandon Chota. She moved south and settled on the Ocoee River near present-day Benton. There she operated an inn on the Federal Road until her death in 1822. 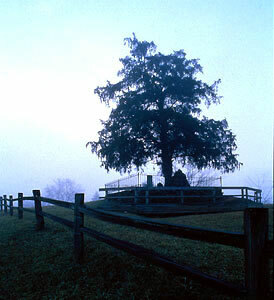 Her grave is located on a nearby hill beside the graves of Five Killer and her brother Long Fellow (The Raven). 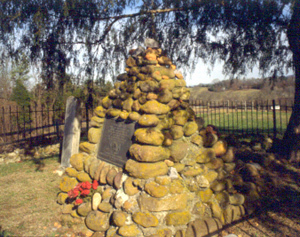 A monument was erected on her grave in 1923 by the Nancy Ward Chapter, Daughters of the American Revolution.